Part of me is a little upset with myself for not writing this post before writing three others: Launch, my monthly What I Learned In June, and Afternoon. The rest of me is learning not to care that much about things that don't really matter, like the scheduling of my blog posts. I'm writing this post from the house I grew up in, back in the Dallas suburbs. I came home from England on Monday evening. So I've had two days of rest and relaxation. Those two days (plus the two travel days) make CASI feel like it happened half a lifetime ago. It's hard to believe that on this day last week, I was at the Parish Church in Falmouth, having an intensive coaching for our concerts. Yes, this is the Concert Post. Last Wednesday afternoon, after our visit to Pendennis, CASI gathered in the Parish Vestry to have a concert run-through. Rather than singing near the end of the program, as in Oxford, I sang second on both Cornwall programs. I'm never really sure whether I like singing early in the program better than later. I haven't decided yet. I'm sure I'll let you know. Anyway, I sang, and my voice was exhausted. I didn't do well at some of the things I had worked on: the consistency of my voice was spotty in places, and in the attempt to add interest to my performance, I was doing too much. Dr. Sadlier hit the nail on the head (as he typically does) by saying, "Sara, I wish you would just focus. There is power in focus." As usual, everything that the faculty said to me was awash in truth, and it was exactly what I needed to hear. But sometimes, you're just frustrated, so I stepped outside to cry a little bit. I promise that I'm not a gigantic child, y'all. When I'm frustrated, I express myself through tears (we can all thank AIMS for this. I'm actually eternally grateful for it, but that's another post). Kourtni, our precious administrative assistant ("Most Likely to Save the World") hugged my neck and assured me that it was okay to cry. Later, Marc, our fantastic acting instructor, came out of the room and spoke to me. I was on the right track, he said, but there were things I could do that would help me more. Now that I was actually doing something, he said, there was more to talk about, rather than there being nothing to talk about when I was neutral in my performances. He offered to help me hone in on the performance I wanted to create. Here is a moment that I feel I have to explain something about myself as a performer. I've always had good dramatic instincts. For the most part, I've usually been able to get on stage without putting a ton of thought into my performance beforehand and simply wing it -- and the performance usually goes well. CASI destroyed that assumption in me. I'm learning that in order to have a clear focus in my performances, I need to put plenty of thought into them prior to presentation. More on that in a minute. After the run-through, we walked to the Falmouth Hotel to have Cornish cream tea in style. I was pretty down after the run-through. Confession time, y'all: I have this erroneous belief that if I hate myself or the work I've done, then it will get better. This is very motivating, but never truly helpful. It encourages working from a fearful place of I will never be good enough. But Jesus continually breathes into my little heart the reminder that no, I'm not good enough, but because He has been, I don't have to be. Anyway, I was kind of down, but God never allows me to stew in my self-pity for long. It's not becoming a child of God who lives under grace. This time, to snap me out of it, He gave me the encouragement of my beautiful friend Janell. She's a doll. She's so relaxed and easy to get along with, and also very talented. She and I chatted at length about ways to hone in on a character. I'm learning that it isn't enough to walk on stage with a sort-of idea of who the character is. One of the opera directors at Tech always asks his cast this question: "Who are you, where are you, and what do you want?" The where is not so hard, and the who isn't that difficult either -- but the question of who you are is often tied in with the question of what you want. And I think that's been the most difficult thing for me to hone in on. Janell made the point to me that whatever I want (as the character) must be an overwhelming desire: why else would I be singing it instead of speaking it out loud? Also, our desires become more real to us when we say them out loud. The thought often lives inside your head for a little while, growing and whispering and nudging and quietly going about its business, gradually taking up more and more space, like a child growing inside of you. And when you say it out loud, it becomes real. It bursts into existence. It's no longer just your own thing: you've spoken it now, and other people know about it. Singing takes the verbalization to an entirely new level. Words are not enough: we must use music. To identify and point to the desire of the character is a difficult process. You have to probe and think a little bit, sometimes more than I am wont. But as I've begun doing this with each of my songs and arias, the character singing the song becomes so clear, as if she were cut out of crystal. The trick is not just to identify what I want as that character, but also to pinpoint what I hope to accomplish through the singing of the song. When I sing "Quando m'en vo," I know that Musetta wants to entice Marcello: that's what she wants to accomplish by singing this waltz. When Janell and I had talked about this, she asked me what I thought was going on in my song: what did the character want, and what did I hope to accomplish by singing this very angsty Spanish song? When she asked the question in that way, I discovered that the song and the situation and the character became instantly clear to me. Instead of a fuzzy outline, there was a person standing before me, clearly delineated. She was different than I expected, but she was true and real. After tea, I walked back to Ceci and KaLee's room at their B&B. We developed a tradition of watching Downton Abbey after the events of the day -- always the best kind of ending. Ceci and I both love the Victorian era and Jane Austen, so this show is right in our wheelhouse. There was no better company for this show. Writing this makes me miss them terribly. The next day, Thursday, I went in the morning to practice, and after lunch I went and met with Marc about my song. He asked me what I thought I needed to do in order to do better. Sidebar: when teachers ask me to self-evaluate, I love it. It gives me a chance to address the issues that I feel. Plus, it forces me to look at my performance and talk about it, and like I said, things become more real when I say them out loud. I told Marc that I know I could do more to focus my performance. He agreed, and I spent the next thirty minutes talking with him about my vision for this little song. Let me tell you something about myself (This blog is basically about that). My biggest enemy in singing is myself. I am constantly in my own head. Numerous professors and teachers have told me that if I just, for the love of God, stop thinking about my technique all the time, I sound so good! If I just let my body do its thing, then I sing beautifully -- because I already know how. Dr. Sadlier said something to that effect in my last lesson with him, and he did so by using the best analogy I have heard to date. He pointed out to me that in my relationship with Christ and my walking with Him from day to day, I don't have to wonder whether or not my faith will be there. I have already asked the pertinent questions and decided to follow Jesus (like the old hymn says). I just walk with Jesus. Singing, said he, is similar. I know how to sing. All I have to do is start with intention -- I will sing in the body. I will sing with soft palate space and reinvent it on every note -- and just go. Get out of your own head, Sara. When I worked with Marc, I discovered that this was so true. I wasn't focused on my technique. I was focused on the Imaginary Person to whom I was singing (as my character). And, as I've heard and re-discovered many times, I sounded great. My body knew what to do. Lesson here: trust the gifting from God. Directly after my unscheduled lesson with Marc, I walked down the main street of Falmouth to have an intensive coaching on my song. I worked with Dr. Sadlier, Dr. Mrs., and DQ -- a voice teacher, a pianist, and someone who worked on interpretation. They chatted with me about melismas, focusing my sound, soft palate space, and all kinds of things. These last few days were full of a lot of things clicking and a ton of learning, as you can tell. But that's kind of what these programs are about: accelerated learning. That night we had the final CASI party at a restaurant on the quay. I just kept looking around and watching all my incredible friends. I love these people. Afterward, Ceci, KaLee, and I watched more Downton Abbey. The next day, Friday, I had my lesson with Dr. Sadlier, and that evening, we boarded a bus in full concert attire to get to our concert in St. Endellion. The church at St. Endellion, where we were to sing, is the site of the largest classical music festival in England, and it was such an honor to perform there. It was a lovely church, and the concert was lovely, too. I remember being nervous and fretting: What if I couldn't do it? What if I wouldn't remember the things I'd been working on? What if my voice didn't respond the way I had been training it to respond? Essentially, I refused to believe the things I had learned over the previous three days: I refused to believe that I knew how to sing. After I performed (I was second), I thought that I hadn't sung that well. I was pleasantly surprised when I received compliments. As I've written here before: it is not my job to judge the work. My job is simply to show up and sing. The next day was our last day in Cornwall -- a free day. Ceci and I went to the Maritime Museum, one of Falmouth's largest local attractions. The museum tells the story of sailing: of surviving on the sea in dire circumstances, of the way ships and sailing are the lifeblood of Cornwall. The main exhibit was on Vikings. Ceci and I are museum nerds. Afterward, we had our last Cornish cream tea. 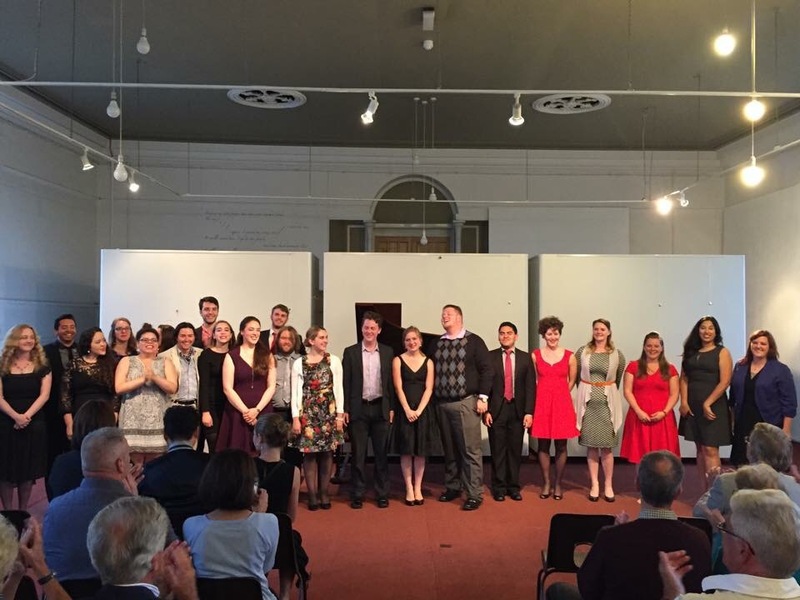 That night, we had our final concert at the Polytechnic Institute on Market Street -- the main street in Falmouth. For this performance, I made the decision: I am going to trust the gifting God has given me. He is not in the business of snatching the gift away. That's not His way. He loves to give good gifts to His children. Plus, Dr. Sadlier was right: I know how to sing. So this time, I decided I was just going to focus on telling a clear story with my song. I wasn't going to worry about it. I was going to trust my voice. Trust is scary. That's why it's an adventure. And may I say: I rocked it. I know it was the best I sang at CASI. Everyone sang beautifully. It was the perfect end to our amazing program. After the concert, we had to face the reality that the next morning, we would all part. We would no longer be a unit. CASI was essentially over. We hugged and cried, and we pow-wowed in the concert hall as a group, one last time. Dr. Sadlier admonished us not to go away and go back to the way things were before. The faculty have given us the tools, he said. It was our job to use the tools. And oh, how right he was. I learned more at CASI than I ever dreamed I could have learned in three weeks. It was everything I needed, but didn't know I needed -- and isn't that the way it works? They have given me the tools I need to spring forward in my craft. I know that the CASI faculty have launched me into the next phase of my artistic ability, technically, dramatically, psychologically, and as always, spiritually. Because singing isn't just about the singing. It's about trusting God. I've got nothing. He has given it all to me. I am just a little child of God who's been given the ability to sing. I can trust Him to never fail me. I can trust Him to always come through for me: because He has never not. Since CASI, I've been practicing and putting those new tools to use. I love the practice and the work, and I love developing and getting better. I can almost sense myself growing as a singer and an artist. CASI has not only been a beautiful opportunity to travel, but also a place to make amazing friends (who I miss already) and a springboard into becoming the person I most fully am. And always, always, always, a way to trust God more. That's really what singing is about for me: trust God. He always takes care of the rest. What a beautiful adventure this has been. From the planes there to the planes home (all with Paddington Bear in tow), I have loved it all. I thank my God every time I remember it. I am blessed beyond measure. Bonus photo: my people on the train to London.